Tomorrow we celebrate Jim's birthday! 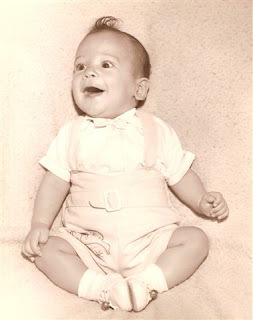 I promised a picture of him as a kid and voila, here are two: See? He's always been a happy person! I'm posting this one because I had one of these running around my house for a few years. 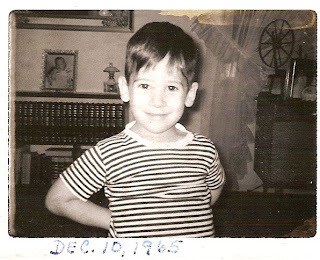 It was not the same year, but it seems to be the same make and model: Seriously, for any of you who knew Jimmy at age 3-4 (that would be my son, not my husband), DOES THIS NOT LOOK JUST LIKE JIMMY (again, the son, not the husband)??? I half expect that after this picture was taken, that shirt was shredded by a pair of Jimmy Scissorhands. But husband Jim probably never did anything like cutting up his own shirt sewed lovingly for him by his Auntie Jenni with his Grandma Olsen's knitting scissors. Son Jimmy did, though (sadly, the slight modifications I made to this particular make and model of Boy Child resulted in some naughty tendencies). I'd insert fun stories about Jim from his childhood, but I was not an eyewitness to any of those stories. The one I do hear about from his mother is the story about the one time he actually was naughty and threw a rock at a little girl and it hit her. The funny thing is that everyone, including the school principal, all agreed that if Jim(my--back then Jim was Jimmy) threw a rock at someone, that someone probably deserved it. 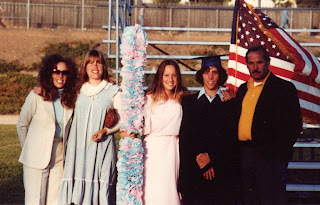 So skipping ahead a few years, here is Jim(my) at his high school graduation with his parents and two sisters. Some other sisters hadn't been born yet and the step-siblings weren't yet in the metaphorical picture. 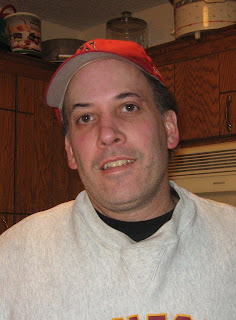 And this is Jim fairly recently. He's aged well I wish I could tell more stories of his childhood, but again, those aren't my stories to tell. I do have stories from 20+ years of living with this guy (which I think puts me in the lead for number of years anyone has ever lived with Jim, either that or I'm closing in on the leader, which I think would be his dad if it isn't me. Sheesh, like it's even a race. I annoy me sometimes). I will say that he actually does poke fun at people now and then, usually me. I know, I know, you all think he's the most mild-mannered person ever, right? Well, one time I was squealing over some pumpkin decoration and coveting it out loud. Jim rolled his eyes and said, "Because you don't have enough pumpkins for Halloween." I was so shocked that all I could do was laugh long and hard that he actually formed a sarcastic comment in his brain and let it out. And to all of you out there who think he lets me walk all over him and he does whatever I want him to...yer wrong. But I can't think of any evidence to back up my claim. OH--he did tell me I had to get a job. Twice. Three times? And he always has to drive when we go anywhere. I have to BEG to drive on long trips. Except for during those three months when he wasn't supposed to drive after his concussions. Happy birthday to my sweetie-pie! I love you tons. Happy Birthday to Jim. I couldn't ask for a better husband for my daughter or a greater father for my grandchildren. He is truly a wonderful person. I don't think I have ever heard Jim utter an angry word (I wish some of that would rub off on me). I am grateful for his service in his church callings and his devotion to his family. I'm so glad that we have Jim and that we all get along. Maybe he doesn't really like me and he just pretends really well. But he is a great guy. Happy birthday, Jim. Jim is such a wonderful and patient man. Sara is so blessed to have you in her life.